For the last months, the pr.co team has been working hard to restructure the toolkit. Because we're moving towards a more collaborative system a big architectural update was needed. If someone wanted to add his/her colleague to a newsroom and collaborate on their presslist, then that would require him/her to invite the colleague to a newsroom, wait for them to sign up, assign that colleague the desired role and manually add them to the presslist in the end. Another problem was when you created a newsroom, you'd then have to manually add your colleagues afterwards. By adding the organisation layer to pr.co it immediately becomes easier to manage newsrooms, presslists, users, but also your billing. This means that from now on you'll invite your colleagues to your organisation and let the system know what sections they should have access to. The workings of pr.co's billing became a lot simpler. Before, any user could pay for any newsroom and managing your subscription was always a hassle. Now the organisation "owns" the subscription and all newsrooms in your organisation will be automatically part of the subscription. Newsrooms that are no longer needed can be archived. You can manage everything in your organisation under the new organisation tab in the blue top bar, next to your account settings. Here you can add or remove users, archive a newsroom or manage your subscription. When inviting a user you can now choose what role he/she should have in the organisation and choose what newsrooms and contacts he/she can have access to. 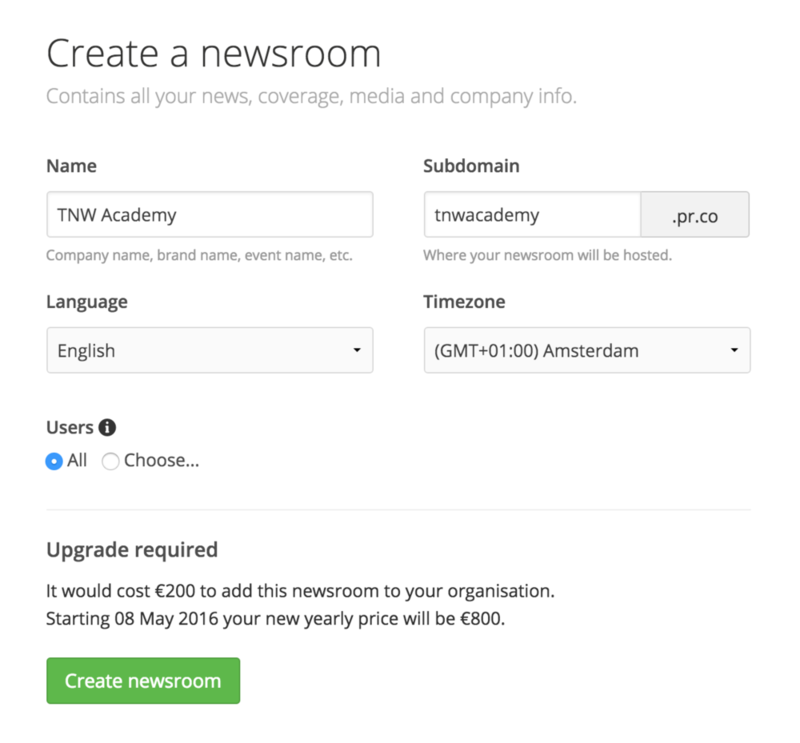 When creating a newsroom you can choose what users should have access to it. 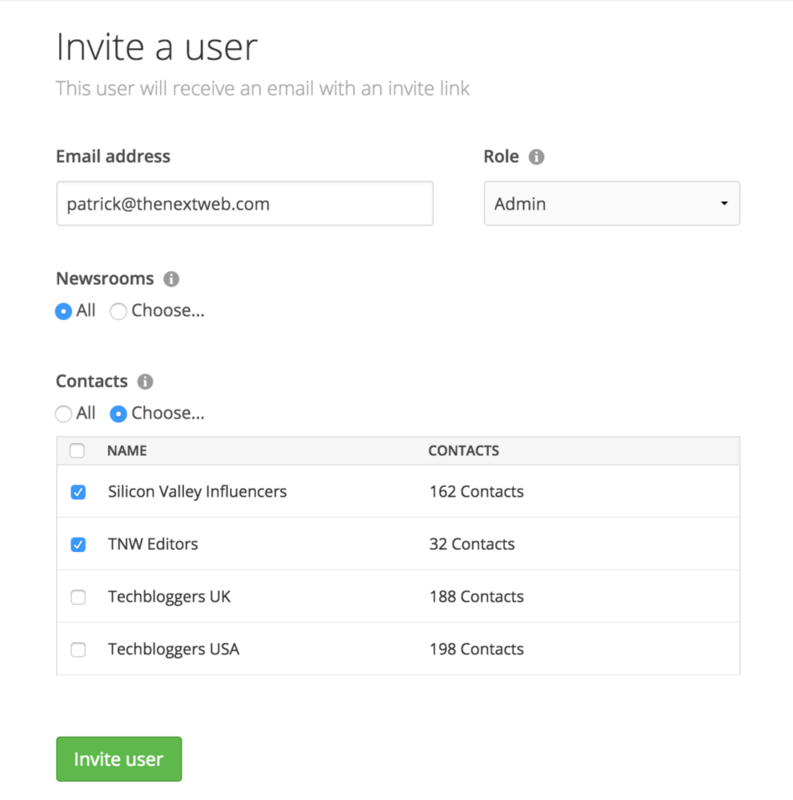 Here you'll find an overview of all users in your organisation, you can see what newsrooms and contacts they have access to, remove then, invite new users and see the status of pending invites. 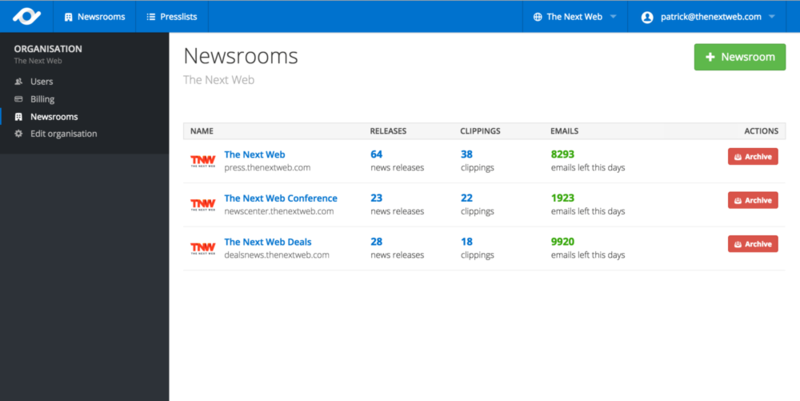 Here you'll find an overview of all newsrooms of the organisation, see how many emails you have left per newsroom, create new ones and archive the ones you no longer need. Please let us know if you run into any problem or have some feedback just shoot an email to hello@pr.co.